Look at this photo someone just emailed me. Ay caramba! Santa Ana and Poncho Villa live. 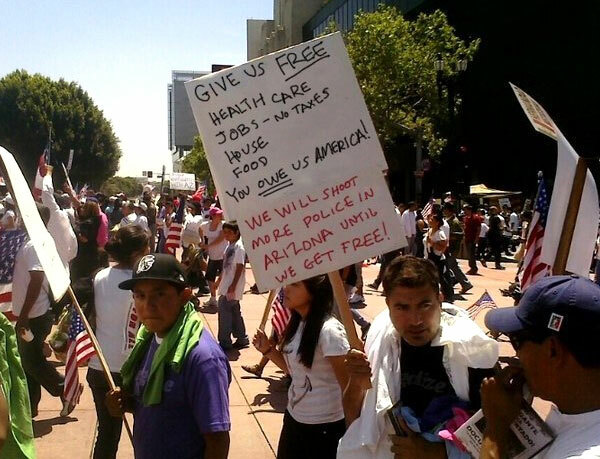 Read the sign that Hispanic guy is holding. Give us health care, jobs, no taxes, house, food. You owe us. We will shoot more Police in Arizona until we get free. OMG. Protect the women and children. Screw that, guard the tequila. We’ll be speaking hablo espan-yole before we can say Montezuma’s Revenge. Of course, I settle down and read the rest of the email. My loved ones? That’s not what the sign says. It says it will shoot Arizona cops. Don’t get me wrong, I know Arizona cops and they’re nice guys, but none of them want to be my loved ones. Hey, wait a minute. Could this email be a hoax? Welcome to my phony fear of a real lie-bomb or what I call a Weapon of Mass Distortion. Here are some tell-tale signs. In this one I am told to pass this on to everyone on my email list. That’s the “mass” in weapons of mass distortion. Notice the tone. It’s angry. I am suspicious of angry people I don’t know. I think they have an agenda. They remind me of an Iranian Ayatollah. Think about what is happening in the news. Comprehensive immigration reform is about to pass. Here’s my previous take and a primer for you. Can you spot a distortion? Is the photo real? Could it have been altered? On this last point, it’s hard to detect the distortion in this this weapon of mass distortion. However, if you lived in LA or Phoenix, then you may have spotted it immediately. For everyone else, a quick Google search finds it. Here’s the link. A further search of Google finds no news stories about a rally where someone was inciting people to shoot cops. To be fair, this rally might have happened. And there may have been someone holding a sign with this frightening message. And the site I found to refute the email may be a fraud too. Who knows; it might have been someone in favor of immigration reform who wrote this inflammatory email pretending to be an opponent of reform to make the opponents of reform look stupid. The bottom line: you don’t really know; or you don’t know with any certainty. So, what do you do? Don’t forward it. Here are the Informed Not Inflamed rules to handle weapons of mass distortion. There’s no junk mail filter for friends — except you. Forwarding a false email is immoral and unethical. Think about it this way. What if you received an email falsely claiming that you are a murderer or a cheat; would you pass it on? Make sure the source of an E-mail is an established news organization. If it’s an E-mail with no byline or attribution, delete it. Do a Google search for yourself. Check out the various fact-checking sites. If it comes from someone you don’t know and the author seems to have an agenda, delete it. Reply only to the person who sent it. Tell him or her why the E-mail is false or misleading and provide the corroborating links or articles. Don’t be surprised if that person doesn’t respond to you or thanks you. Many people send out emails they agree with. They may not care if it is false. Beware of them politically. Think twice about hitting Reply All. You could piss off people you don’t know who also innocently got the weapon of mass distortion. And some Internet service providers (ISPs) could flag you as a junk E-mailer. The creators of these weapons of mass distortion are getting smarter. They’re using social media and duping the mainstream media. In another post, I will give you some more intricate ways of investigating and uncovering these new stealthy lie-bombs that appear on Facebook and Twitter – including one targeting the new Pope.